This is a great illustration of the color changes that sunset brings – not just to the sky of course, but to the actual light that’s falling on your subject. Clouds, no matter what, are white – there’s no other color for water vapor to be. But when they block enough light and are seen from underneath, they can appear various shades of grey, and in this case, the sun shining through progressively thicker (and humid) atmosphere casts a variety of colors. Seen from the top of the cloud, the sun would have been well above the horizon, but at about midpoint it was red and almost gone, and where I stood it had already set, thus the silhouetted trees. This same color progression can be seen, in a very limited way, in one of the lunar eclipse photos that Jim Kramer took recently, the one showing the near-total eclipse with a band of white at the bottom of a red moon. I wish I could tell you exactly how big this cloud was, but suffice to say, it was massive, and extended for kilometers both horizontally and vertically, with a really good chance that those underneath it were not only in very dark conditions, but perhaps even in the next state (Virginia was less than 60 kilometers away in that direction) and getting furiously rained upon. 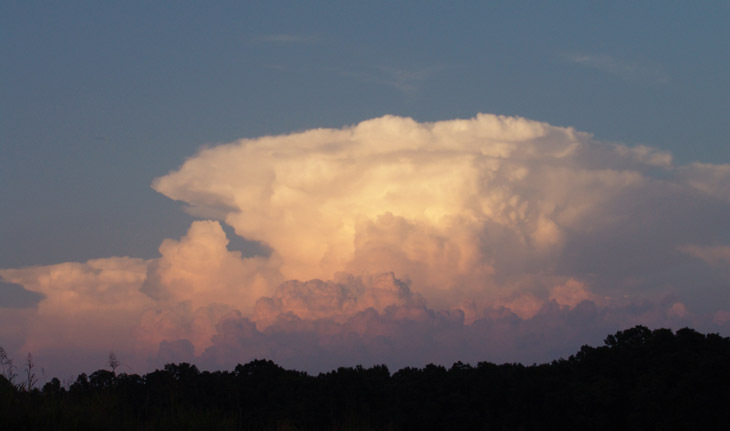 This is a variety of cumulonimbus known as an anvil cloud, where extremely moist air close to the ground is heated by sunlight and hot surfaces and rises rapidly, carrying the moisture to great heights. Somewhere in there (probably not very high at all,) the air hits the freezing point and ice starts to collect around bits of dust and whatnot in the atmosphere while still being carried upward by the rising air mass. Ice continues to accumulate, and eventually it gets too heavy for the updraft to sustain it and it falls again, usually melting as it passed into the warmer air below and exiting the bottom of the cloud as rain. With some fierce updrafts, typical of summer thundercells, the ice gets blown around far too much and accumulates enough that it doesn’t have time to melt during its eventual descent, falling as hail – this thunderhead stood a pretty good chance of being one of those, since the ‘anvil’ appearance occurs when the air mass slams against the underside of a different air layer that doesn’t permit humidity to penetrate, and spreads out underneath it. Electrical storms often occur in these conditions. Moreover, there’s a common atmospheric effect that can just barely be seen (it shows much better in skies with just a haze of humidity): the Belt of Venus. Down low where the clouds take on a wonderfully rumpled appearance, things get pretty dark and blue-grey – this is actually the shadow of the Earth being cast on the clouds, and in the right conditions the curvature can been seen. Since our atmospheric layer is actually a very thin shell on the planet, and the portion that can carry humidity which allows this shadow to be seen is thinner still, the effect passes quickly as the Earth rotates, and never lasts more than a few minutes. Here’s a slightly better version taken from a dock, earlier this year. If you’re sharp-eyed, you might have noticed the light shining on the edge of the dock and surmised that the sun wasn’t fully set where I stood. 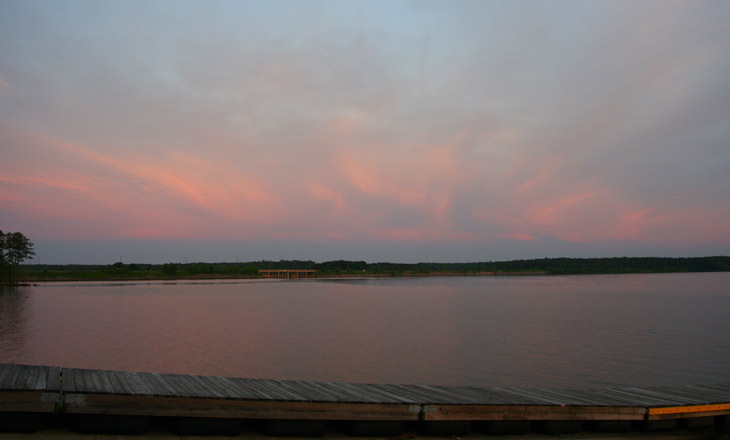 But it’s not sunlight shining on it, or not directly, but the reflection off of the same high clouds, just those behind me – the sky continued to glow brightly after the sun itself disappeared, and that’s what’s causing the glow on the edge of the dock.